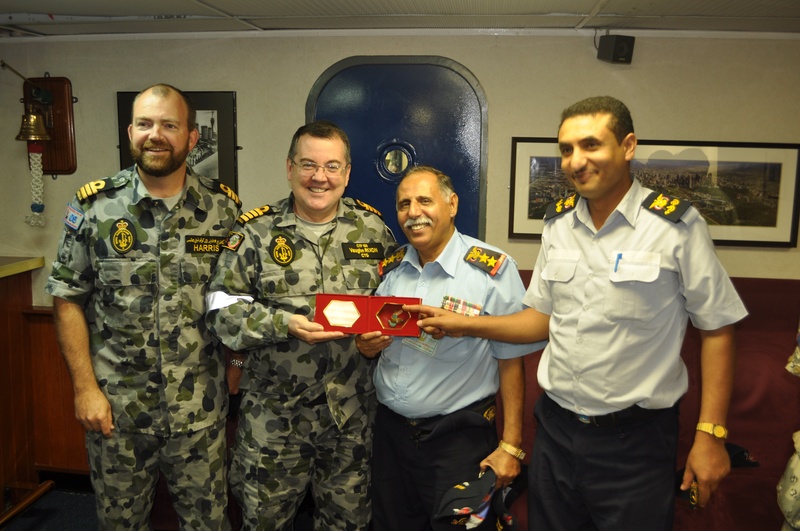 Royal Australian Navy frigate HMAS Melbourne (FFG 05) was the venue for a conference off the coast of Aden, Yemen, between representatives from Combined Maritime Forces (CMF) and the Yemen Navy and Coast Guard, on Dec.16. HMAS Melbourne is currently serving with CMF’s counter-terrorism and maritime security mission, Combined Task Force 150 (CTF 150). The purpose of this conference was to establish mutually beneficial links between CTF 150 and the Yemen Navy and coastguard in order to share information and enable greater cooperation in the future. The conference was chaired by Royal Australian Navy Captain Vaughn Rixon. Speaking after the event, Captain Rixon said “This has been an excellent opportunity to discuss common challenges in maritime security with a view to developing a greater level of cooperation between CTF 150 and the Yemeni Coast Guard and Yemen Navy”. CTF-150 was established to help create a lawful and stable maritime environment free from terrorism and related activities. The area of operation spans over two million square miles, covering the Red Sea, Gulf of Aden, Indian Ocean and Gulf of Oman. These waters are a vital artery of world trade that include the main shipping routes from the Far East to Europe and the US with over 23,000 shipping movements per year. In addition the region contains three narrow waterways, known as ‘choke points’, which are bounded by a number of countries and through which the majority of vessels in the region must pass to ply their trade. Australia assumed command of CTF 150 from Pakistan in October 2010. This task force has previously been headed by Canada, Denmark, France, Germany, Italy, the Netherlands, the UK and U.S.
HMAS Melbourne arrived in the Middle East region in September 2010. In addition to working with CTF 150 she has also spent time with CMF’s counter-piracy mission, CTF 151. CMF is a unique naval partnership based in Bahrain, consisting of 25 member nations, which contribute ships, aircraft, personnel in support of the mission. CMF works to promote security and prosperity across some 2.5 million square miles of international waters in the Middle East and is committed to defeating terrorism, preventing piracy, encouraging regional cooperation, and promoting a safe maritime environment.